Amid the ongoing conflict between Israel and Palestine, the Conservative Party of Canada has taken the unusual step of promoting a video reiterating their support for the Jewish state. 'Through Fire and Water', posted on YouTube on Wednesday afternoon, includes a recent history of clips, speeches and quotes from Prime Minister Stephen Harper and Foreign Affairs Minister John Baird. The video's YouTube page includes a link to the Conservative.ca website where you can enter your email address and postal code to tell the party that you too "stand with Israel." The fact that the Tories are pledging their support to Israel is no surprise. Both Harper and Baird have positioned themselves as the world's most staunch supporters of the Israeli regime in the very divisive conflict with Palestine. In January, Harper became the first ever Canadian prime minister to address the Knesset, the Israeli Parliament, speaking of the bond between the two countries and explaining his unflinching support for the Jewish state. "We either stand up for our values and our interests here in Israel, stand up for the existence of a free, democratic and distinctively Jewish state, or the retreat of our values and our interests in the world will begin," Harper said to great applause. And just this week Baird lambasted a United Nations official for criticizing Israel. "Canada rejects UN High Commissioner for Human Rights Navi Pillay’s uncalled-for criticism of Israel’s response to rocket attacks from Gaza. Focusing her comments on Israel is neither helpful nor reflective of the reality of this crisis," he said in a statement. "There must be no moral equivalence between Hamas, a listed terrorist organization, and its blatant disregard for human life, and the liberal democratic State of Israel’s duty and obligation to defend its people from cowardly and indiscriminate attacks." Right leaning political communications consultant Gerry Nicholls says that this is typical of the Harper Conservatives. "If there's one thing we know about the Conservatives, it's that they are not big on subtlety and this video is a case in point," Nicholls told Yahoo Canada News. "Using powerful emotional images and words, it hammers home the idea that under Prime Minister Stephen Harper, Canada is Israel's best friend. 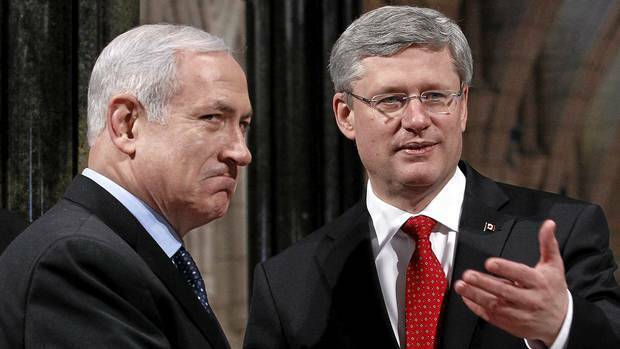 And what's happening in the Mideast right now, only adds more power to Harper's words." The video, Nicholls adds, is more a message to Canada's Jewish diaspora than to the Israeli government and its people. "Certainly this video will resonate strongly with Canada's Jewish community but also with the Conservative Party's base, which is pro-Israel," Nicholls said. "In fact, I suspect the Israel issue cuts well for the Conservative, in that it's an issue that unites the Tories but divides both the NDP and Liberals. If either NDP leader Thomas Mulcair or Liberal leader Justin Trudeau, try to match Harper's pro-Israel rhetoric it might alienate part of their rank and file. So Harper basically owns this issue and he's making the most of it."